The invitation read, “upon arrival tell the doorman you are here to see Marlo”. That was it, no apartment #, no such and such residence, just Marlo. As it is dinner time we enter amidst a hub of delivery people, folks coming home from work or heading across the street to the park for a run. We make our way through to the doorman and simply say, “um, Marlo?”. He just smiles, nods and says, “Sure, take the elevator straight ahead,…to the top”. 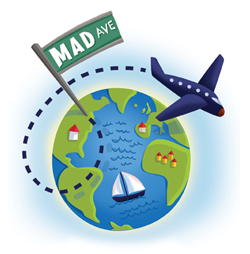 When Travels from Mad Ave started, the idea was to share the unique and interesting experiences I have had as a veteran of the advertising business. Through this business, I live a life I never imagined. In the beginning I certainly could never have imagined spending an evening= dining at Marlo Thomas’ apartment. We all met Marlo as “That Girl”, but I have always cherished her as the creator of “Free to Be You and Me”. The movie that played a large role in shaping my beliefs on tolerance. We were graciously received by Marlo herself on arrival and shown around her gorgeous apartment overlooking Central Park. A wraparound porch provides almost 360 views of the city. While all of this was worth the price of admission, what was most inspiring was her openness and inspirational passion for helping all women achieve their dreams, no matter how small. After dinner she said a few words but then wanted to hear from each one of us about what our real dreams were. She wanted to know, if we had the opportunity to push the reset button, what would we do now? It’s difficult to answer that question putting aside the context of your last 10, 20 or 30 years, but she made us dream. Later on in the evening, I asked her, as an early leader of the woman’s movement back in the 60’s & 70’s, what struck her as most surprising sitting here in 2012. Her answer was how few women were in leadership positions. That is a theme I have been hearing from many of these women (ie. Charlotte Beers, the first female CEO of Ogilvy and author of, “I’d Rather be in Charge”). Work/life balance, can you really have it all, etc. has been at the center of our generation’s discussions around women’s empowerment and seems to be bubbling up again as a key issue. I believe we need to reframe the discussion and redefine success. Since the women’s movement, women have been striving to achieve success in male terms. People like Marlo Thomas and Charlotte Beers are leaders., once again, in reframing the dialogue. I will continue explore this challenge here at TravelsfromMadAve, but be sure to follow Marlo at www.marlothomas.com and get a copy of Charlotte Beer’s, “I’d Rather be in Charge”. And please feel free to comment! !